Let’s just pretend there’s no more drama when it comes to what the Cleveland Browns do with their No.1 draft pick next week. For the time being, we can just buy into the almost-unanimous prediction of them selecting defensive end Myles Garrett. We’re doing this both because everyone seems pretty convinced of said outcome and also just to give me much-needed peace of mind. With this pick hypothetically made, it’s now time to open the conversation to Cleveland’s No.12 selection. Speculation has run rampant when it comes to what the Browns will do with their second first-rounder. Though the majority of pundits believe the team will take a quarterback, there’s still no consensus on just who it’ll be. The most popular name seems to be Mitch Trubisky. Some believe the former UNC Tar Heel could fall to Cleveland at No.12, while others are predicting the team trades up to go get him. Either way, despite a few clamors for Deshaun Watson or Pat Mahomes, it’s Trubisky who finds his name tagged to the Browns most often. Taking Trubisky with their second first-rounder wouldn’t be frowned upon, especially since he’s considered the best available prospect. He’d receive a little extra hype in Cleveland since he grew up in nearby Mentor and has indicated he’d love to play for his hometown team. I’ll hardly deny the fact the “hometown guy saves the franchise” story would be an enjoyable one. However, the local aspect with Trubisky comes with some significant pressure, something the Browns legitimately need to consider if they’re indeed leaning towards taking him. Sure, it’s always great to hear one of the draft’s more talented prospects note his desire to play for a team knee-deep in decades of failure. That Trubisky has seen firsthand the quarterback graveyard Cleveland has assembled over the past few seasons and still want to play there is admirable to say the least. However, there’s a difference between joining any other struggling franchise and one you grew up watching. Sure, the fans of Cleveland will pin their hopes on any QB the team would select this year. This will always be the case. That said, being local adds the “this guy gets it” factor. Since Trubisky grew up rooting for the Browns, surely he knows how desperate this team is for a franchise quarterback. As a result, this will also intensify the pressure he’d face, as supporters would instinctively increase their expectations in hope that clearly it’ll take a local player to help save the team. Bernie Kosar, the last great Cleveland quarterback, shocked the NFL when he manipulated the 1985 draft process so he could play for his hometown Browns. That he succeeded during his time in Cleveland has made him a local icon. Now, any time a QB from Northeast Ohio ends up on the Browns, fans understandably hope said player ends up becoming the next Kosar. However, the former Brown has noted the drawbacks of playing for your hometown team, citing weight of fan expectations and the amount of “new friends” you never knew you had as reasons why it’s not as glorious as people make it out to be. It’s certainly a lot to hoist upon a young prospect, something I’m sure Brady Quinn or even Brian Hoyer can attest to. While Trubisky will be expected to succeed no matter where he ends up, there’s no arguing the fact playing in Cleveland would be a completely different situation. He’s already seen as raw, and with only one season of college ball under his belt it’s tough to believe he’ll be ready to go early in 2017, if at all. 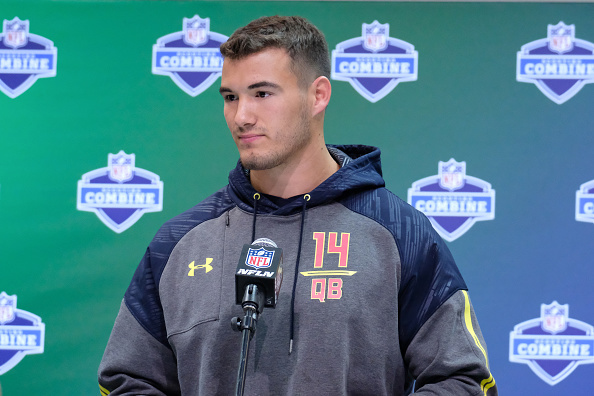 However, the second Trubisky would hit the field, fans will immediately expect him to fulfill the hometown hero expectations. This will be the case whether he’s ready or not. Again, no matter which QB the Browns end up taking next week, said rookie will feel the pressure of a city dying to see anything looking like a franchise savior. However, the burden would be even more significant for Trubisky merely due to the fact he can sympathize with the fans. He’s endured the same hardships other Browns fans have, only he’s seen as someone who could potentially fix it. If Cleveland feels he’s ready to take on this duty, by all means select him with the second first-round pick. However, if there’s even the slightest doubt, the Browns simply have to consider another prospect.